Santa Barbara was still in the throes of the 2008 financial crisis when a wildfire blazed through the city in November of that same year. Of the hundreds of homes torched by the Tea Fire, the home of Eva Ein and Michael Palmer was one of the first to go. 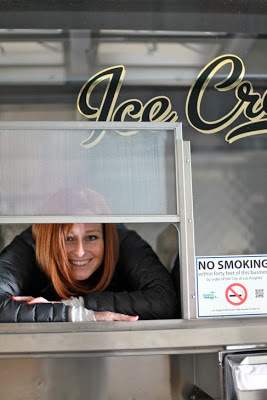 After working through the loss of their beautiful home in an already battered housing market, they made a very unlikely move: they took over an ice cream company. 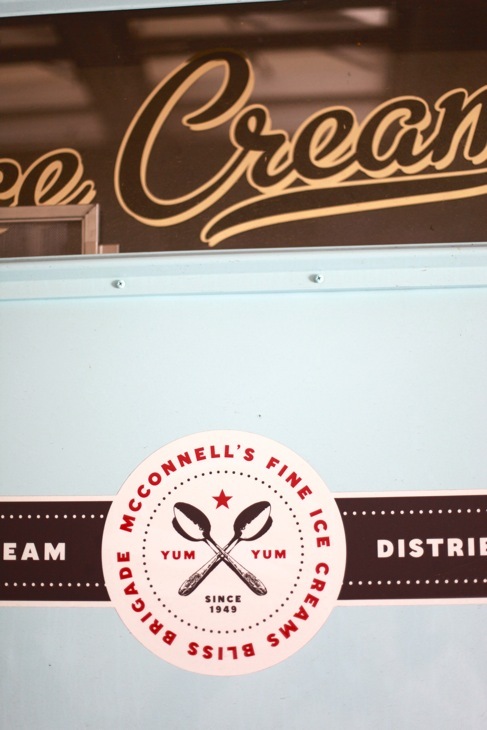 Of all places, McConnell's Fine Ice Creams has it's roots in a health food store in Arizona, opened by Gordon "Mac" McConnell in 1939. In 1942 he was drafted into the army and deployed to England. Fortunately, he made it through the war and discovered French pot ice cream while passing through France en route back to the US. 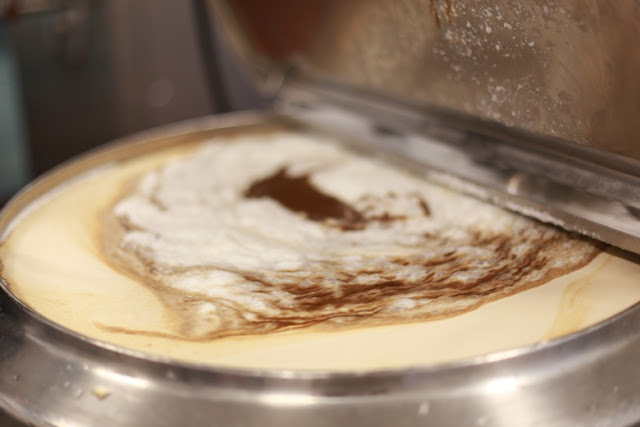 Unable to find an equivalent ice cream in his home country, or a machine that could make it, Mac dismantled and rebuilt a machine in order to make the creamy, low-air-content ice cream he'd had in France, thus inventing a hybrid french pot ice cream maker. McConnell's Fine Ice Cream was an instant success. After Mac passed away in the early sixties, it was taken over by Jim and Jeney McCoy who ran the company for 49 years. 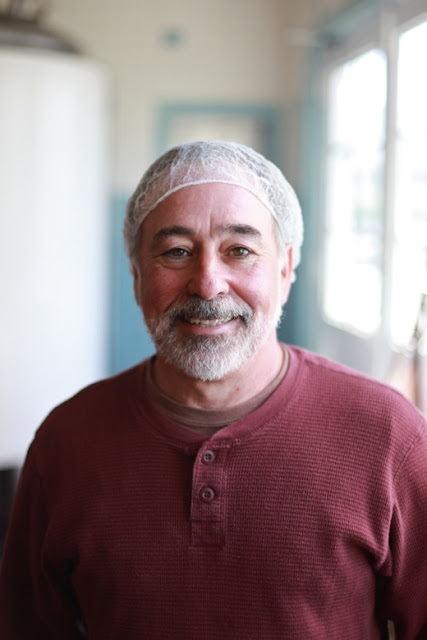 Master ice cream maker Mike Vierra was hand-picked out of Cal Poly University in his early twenties by McConnell's second owner, Mike McCoy. 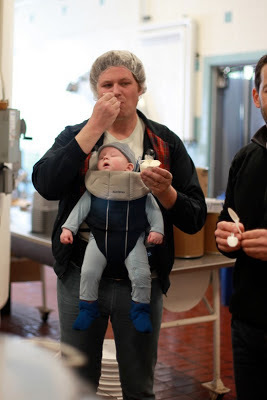 Along with a scientist's knowledge of the molecular life of sweet, cold dairy, he has the sage presence you'd expect from someone whose job it is to bring the simple joy of ice cream into the world. 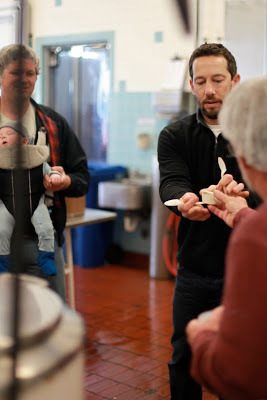 Michael Palmer introduced us to Mike Vierra as we put on our hair nets and later admitted, "You could give me, Michael Palmer, the finest ingredients, 18+% butterfat mix, and I'd make you an awful ice cream. The secret sauce at McC's is the combination of Mike Vierra and Eva Ein. 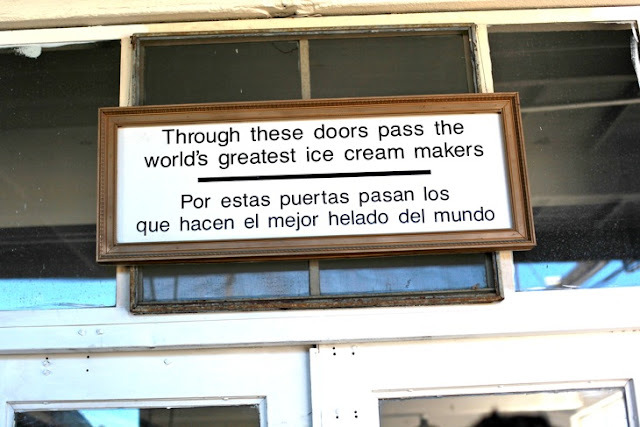 It's their recipes and craftsmanship that bring all of these outstanding components together and make the product what it is, the finest handcrafted ice cream on Earth, no, in the Universe!" He also clarified what it truly means to make a product from scratch, "in a world of marketing speak, where the terms 'handcrafted' and 'handmade' are bandied about like no one's business, McConnell's had always been and remains a truly handcrafted product...we do everything from scratch, from baking our own inclusions to processing our own chocolates, coffees, etc., to handcrafting every one of our uniquely indulgent (18% butterfat - the only company in the business at this level) recipes, from scratch. 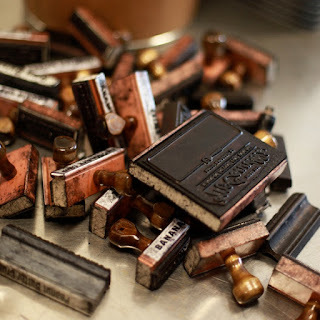 And while we do use some extracts, many of which we make ourselves - we use very few actual flavorings." 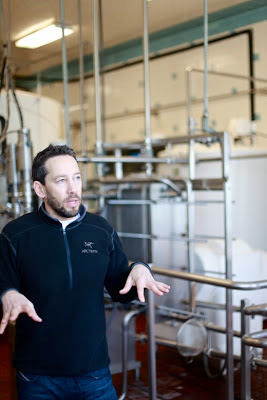 "The brands that do claim to pasteurize (there are a few, artisan brands that make this claim) are actually re-pasteurizing already pasteurized milk, which is very different, not nearly as labor intensive, and not nearly as from scratch (in fact, one could argue the point of doing this at all.) McC's has an almost 70 year history of obsessive perfectionism in this regard." 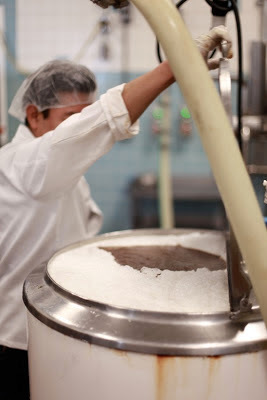 He continued, "We are the only artisan creamery (in my knowledge) that actually does everything from scratch, including pasteurize our own, year-around, grass-grazed, Central Coast milk and cream, from raw. Why is that significant? 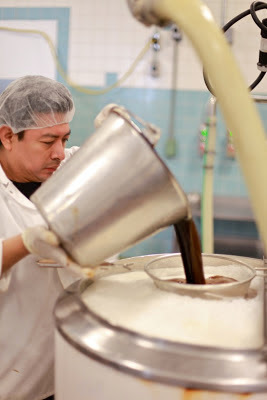 Because we're a dairy, we've been doing it this way for almost 70 years, as opposed to other brands - even artisan brands - most of whom buy pre-made ice cream base from dairies, then add flavorings, etc." It didn't take much time at all to realize how important the history and track record of this establishment is to the new owners. The room in which the ice cream is made still has all the original tiles and furnishings from the 1940s. In the tradition of Mac McConnell, Michael's obsession with low overrun lead him to commision a one-of-a-kind mixing pot from German engineers. 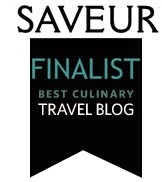 Understandably, we weren't allowed to photograph it, or write specifically about what makes it work so well. But we were allowed, encouraged even, to taste what it pumps out, which happens to be the best ice cream I've ever tasted. 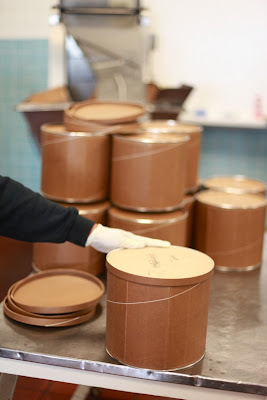 What we tasted in the factory blew away any previous ice cream experiences I've had, whether it was gelato in Rome or sorbet on the Ile Saint Louis in Paris. This is largely because of The Spigot. 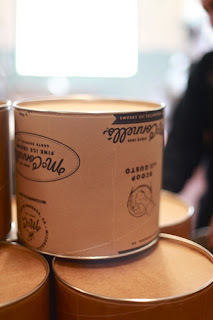 McConnell's ice cream from the pot or from the shop is already on par with the best I've had, but what comes out of The Spigot is extra special. 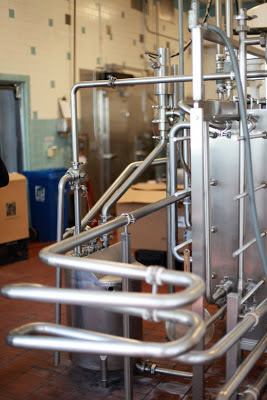 It goes like this: the flavoring is mixed into the liquid sweet cream base (milk, egg yolks, sugar, and cream); then it goes into the Mystery Machine where it is chilled and mixed into ice cream; then it comes out of The Spigot into big canisters. These canisters go into the deep freezer which lowers it to a very specific and secret temperature. This enables it to be packaged and delivered without forming any unwanted crystals. The soft, slightly higher-temperature ice cream that comes out of The Spigot has an incredible creaminess and freshness that is otherwise indescribable. I've heard from several people that the best thing they've ever eaten was fresh buffalo mozzarella straight from the cart in an open market in Campania in southern Italy. Because of the freshness, it just doesn't compare to anything that has to be shipped and refrigerated. 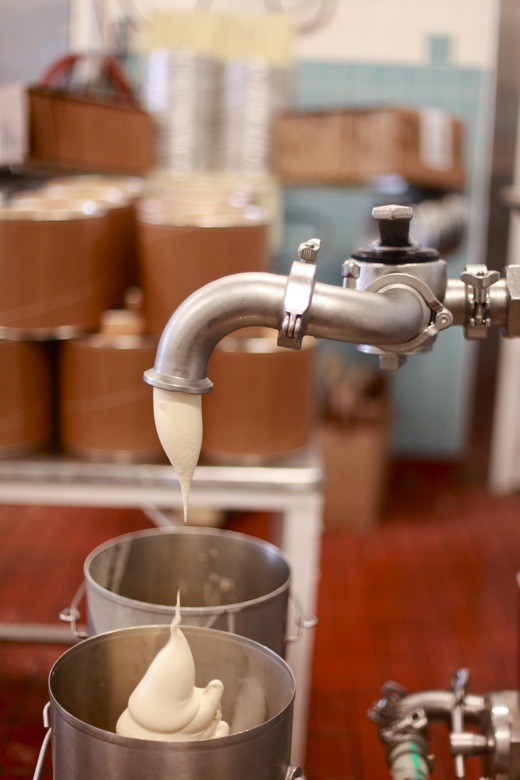 The Spigot produces the ice cream equivalent of that mozzarella. 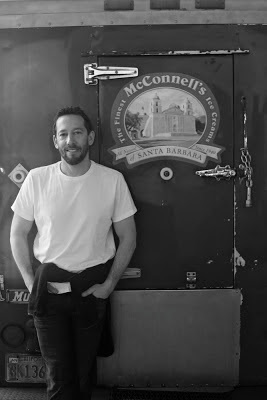 McConnell's uses free range organic eggs from central California and dairy from a handful of family run cooperatives in the greater Santa Barbara area. 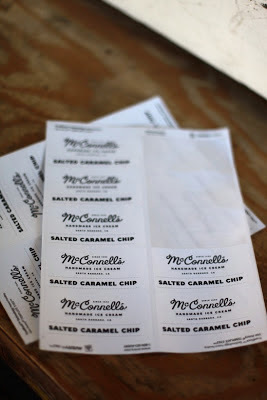 But Michael explained to us that he didn't want to push the "local organic" stamp to the forefront of what McConnell's is about. 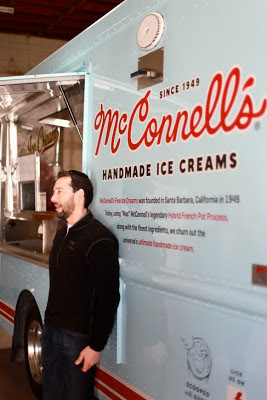 He and Eva want McConnell's to be, first and foremost, a family-run business that offers the best possible ice cream. For them, the local and organic aspect is a given. The one completely new facet that Michael and Eva have added to the company is the street vending program. 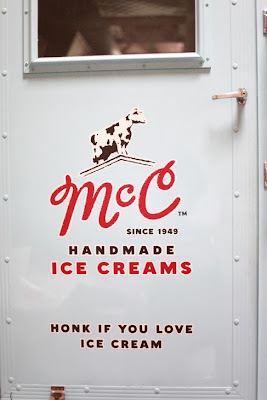 There is the McTruck, a baby-blue mobile ice cream shop that travels the city and country, as well as the McCarts, small ice cream filled push carts. Aside from that, the company is continuing on as it always has. 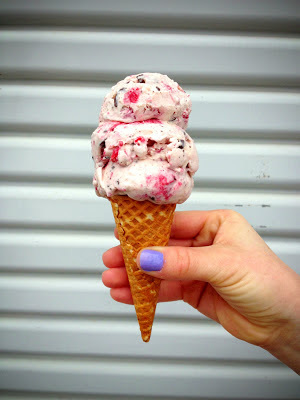 Wow, my first visit to your blog, and I'm hooked; it's as delicious as the prospect of trying McConnell's ice cream one day. Well done, well done! Gosh, this sounds perfect. I (we) love ice cream! 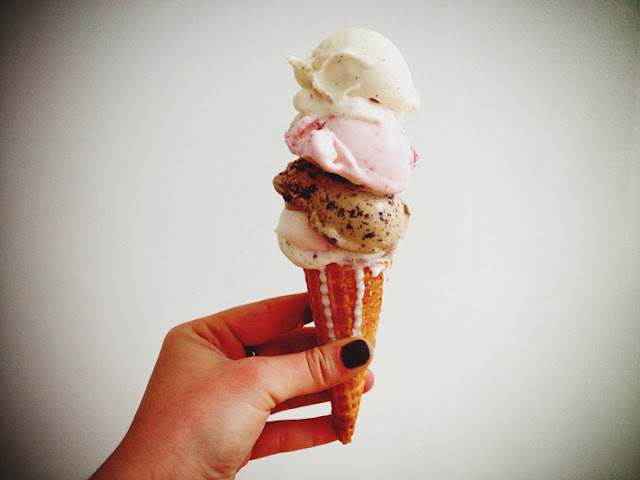 Today we ate local farmer ice cream.. and it was amazing! 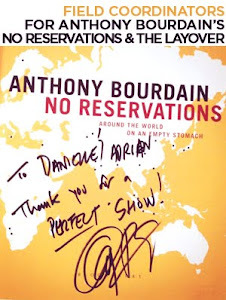 Love to see more of your blog! Ice cream is my favorite. 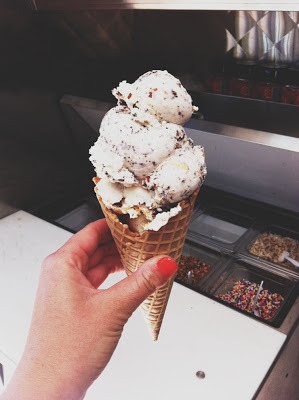 When i see a shop of ice cream, i buy two cup of ice cream as soon as possible. As concern to your ice cream brand i think it is very special and very enjoyable taste so please tell me could it possible to sell your brand online. The comment is written by Sherwood Park Hotel Specialist.